A cervicogenic headache is, by its definition, any headache which is caused by the neck. The term ‘cervicogenic’ simply refers the cervical area, which is a part of your spine located right near the base of the skull. The pain of cervicogenic headache is usually unilateral; it originates in the neck and then spreads to the oculofrontal-temporal areas of the head. The headache initially presents as intermittent episodes and then progresses to an almost continuous pain. Pain may be triggered or exacerbated by neck movement or a particular neck position; it can also be triggered by applying pressure over the ipsilateral upper part of the back of the neck or the ipsilateral occipital region. One of the most prominent causes of a cervicogenic headache is simply undergoing an excessive amount of stress to your neck and spine. There are several factors that can contribute to making cervicogenic headaches more severe or happen more frequently. These include fatigue, problems sleeping, disc problems, current or prior injuries, poor posture and stress on the muscles. Common symptoms of a cervicogenic headache include a steady, non-throbbing pain at the back and base of the skull, sometimes extending down to the neck and between the shoulder blades. The pain can also be located behind the brows and forehead. 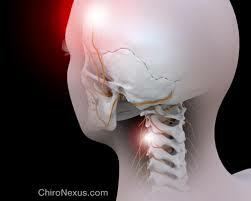 Because of the location, most of the pain is felt in the head, even though the problem is originating from the spine. Pain usually starts after a sudden neck movement, such as a sneeze. Along with head and/or neck pain, symptoms may include nausea, vomiting, dizziness, blurred vision, becoming very sensitive to light or sounds and feeling pain down one or both arms. The neck also becomes very stiff and the patient may have trouble moving.